Visual Composer is designed by the guys at WP Bakery. It’s a paid plugin that is not openly available on the WordPress plugin directory. You can only download it from CodeCanyon. In Tradent Cryptocurrency Theme, we added Visual Composer for those who prefer working with this plugin. To activate the VC plugin following theme installation, go to Appearance > Install Plugins section, install it, and activate it. The plugin will then be ready to use. Plugin installation following theme activation is available in the same section where the default WordPress editor is visible. In the create/edit page above the WordPress editor you will see two large, blue buttons called Backend Editor and Frontend Editor. 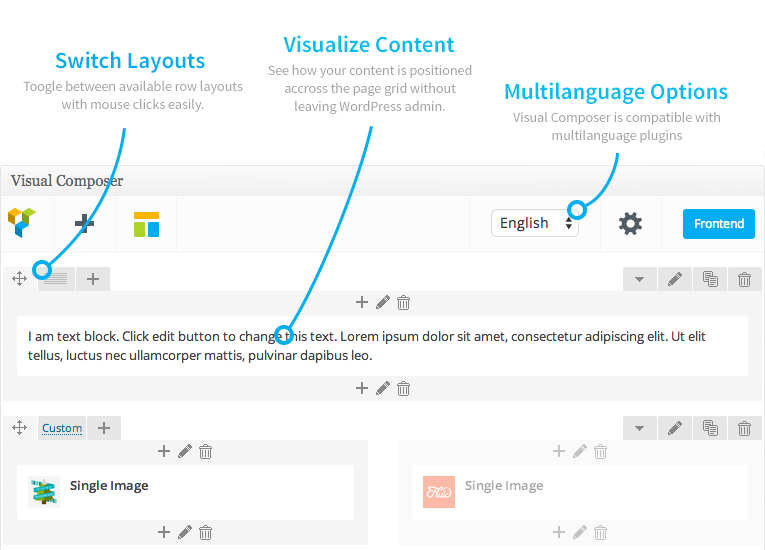 These are exactly what you need to build content within Visual Composer. The most powerful feature of the Visual Composer is that it gives you an easy drag and drop page builder that can be used from the standard WordPress page/post edit area or directly from the frontend. Build your content on the go with WordPress frontend editing page builder plugin. No more admin panel needed to create stunning and beautiful pages. Visual Composer introduces new game changer in the world of WordPress plugins. Experience the true “What You See Is What You Get” and forget about “blind designing”. Add and drag elements around the screen to quickly build unique layouts inside your WordPress theme. Visual Composer determines type of elements you add and highlight them with different colors in order to improve user experience and navigation. Switch between Guide modes to enable or disable VC menu elements and row/column borders. Create responsive pages with brand new responsive design controls. Visual Composer frontend page builder allows you quickly switch between different devices to check how your content looks on tablet or mobile devices. Ensure that everything is according to design grid and your high expectations. In addition to game changing frontend page builder, award winning backend editor is available. Quickly build any type of page with simple and intuitive drag and drop interface right from your WordPress dashboard. Backend editor of Visual Composer has been proven to be one of the most beloved WordPress plugins of all times and it is a no brainier for thousands of WordPress power users. Tons of features and regular updates always keep Visual Composer on top of competition and this allows users to update and manage content fast and easy. Visual Composer offers all the controls you need to work with content elements – add, edit, duplicate, remove or create presets for your elements whenever you wish with just single click. And with the smart Role Manager that is included in our page builder you can control access and options available to different user roles within your WordPress site. Control your WordPress site layout like never before. There are 60+ pro looking templates covering all the website sections you may need. Use predefined templates or create your own templates to reuse content and save even more time.